You are here: Home > Media Releases > Time One tackles mankind’s most baffling question: How did the world begin? Winnipeg, Canada, March 12, 2013 – After challenging old thinking about forty-seven crucial scientific problems, Time One author Colin Gillespie solves forty-five of them and comes up with a strikingly simple answer to the most perplexing question of them all: How did the world begin? The protagonist—a beach bum—takes his cues not only from the likes of Aristotle, Newton and Einstein but also from Lewis Carroll, Raymond Chandler, Frank Herbert—and even Mariah Carey—among many others. And the most helpful if least likely source is the imaginary detective who becomes his sidekick. One of the book’s central (and most entertaining) premises is the detective’s use of science’s great stumbling blocks as clues to what happened before the Big Bang. 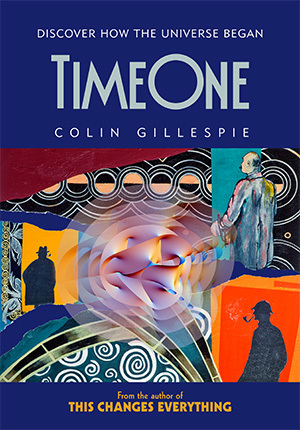 Time One is published in hardcover by Big Fizz Inc.
A publisher of printed books and digital media, Big Fizz promotes new thinking about deep —and sometimes very old—ideas. In seeking to enliven dialogue with communities it shares, Big Fizz uses new media, commissioned art, and a variety of live and virtual events to prime participation in the universal conversation.